The month of 30 Tales to Give You Goosebumps continues. Today's tale is called "Click." 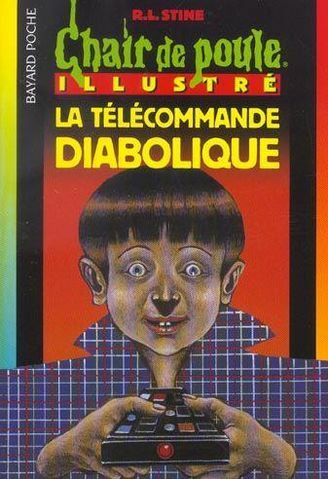 Judging from the strange french version of the cover art above, the story seems to be about a boy with a terrible haircut and questionable fashion sense watching tv. Is there a ghost in the remote control? Maybe. 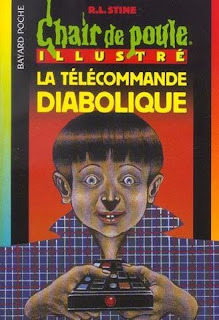 Lets read. Seth Gold's father just came home with a brand new universal remote control. This may sound boring, but the universal remote was a pretty new thing to behold in the 90s. It could control your tv, your cd player, your vcr, and even a laser disc player. For you young people, these are the things your moms and dads watched and listened to instead of youtube and spotify. Seth being a media junky was totally thrilled to have a new remote to control EVERYTHING. It started out innocently enough with a marathon of testing by Seth. Why not watch the weather channel with a cd playing if you can? But then his 4 year old sister wanted to watch a video tape and there was a scuffle that resulted in a broken remote. He did his best to get it back in working order and things seemed to work as normal... at first. Then comes mom nagging about how he's had to much TV and needs to do some chores. As a joke he pressed the mute button at her but it actually worked! She kept talking but no sound came out. I guess this remote really can control EVERYTHING. Seth had more ideas in store. Slow mo on the dog. Rewinding desert so he can have extra pudding. Pausing class so he can cheat on a test. Take extra dessert at the cafeteria (dude loves desert) and muting the lunch lady's complaints. But then there was trouble. First he couldn't unmute the lunch lady. Then a rival classmate took his remote. In retaliation Seth pressed the freeze frame button on him but other classmates could see it happen! The principal saw it happen too! She gets frozen too. This starts a general panic mob mentality against Seth who still can't unfreeze anyone. The mob chases him. None of the buttons seem to do anything at all anymore. In desperation he hits the OFF button. Everything is gone. The school, the students, the light, the sound, the world, the universe, all gone. Seth is alone in the blackness. Just Seth and a remote control that says "battery dead." Yesterday I wondered aloud whether this story would bare any similarities to the Adam Sandler movie of the same name. Well now I wonder no more, because it sure as hell does. The whole premise is exactly the same. They both have a magic remote control that can control the universe. I kind of wonder why no one got litigious. You think they could have at least maybe got the movie to use a different name or something. Oh well. Ok. I know I've already compared this to the Adam Sandler movie but it's been a trend for me to compare these short stories to other Goosebumps full length books. The most similar one I'd compare this to is Cuckoo Clock of Doom. That story had a magic clock that sent the main character backwards in time. Yes time travel is a bit more common than a magic remote control, but the idea of this mystic artifact masquerading as a common item that can unravel the basic laws of the universe hold them close together as stories. So let's talk about the remote. A remote that controls anything opens up a lot of possibilities. The short story format and the fact that it's a Goosebumps story limit a lot of those possibilities. However, I think even bringing up the idea of such a magic device to a young person and showing them a bit of what could play out would really activate the imagination of a child. Who knows, this short story might have been the first one to introduce a child to this general kind of science fiction device. That is kind of cool. But is it scary? Well... a little. It is interesting how the remote quickly goes from a fun and powerful tool in his life quickly to a scary malfunctioning menace to existence. It would have been nice if the story could have been slightly longer and had some more consequences to his actions. The ending though... it's bleak. I mean it is played out in a comical way. When you think about the reality of it though. Seth just gets to sit in nonexistence presumably for eternity. See? Bleak. Very bleak. I hope this story didn't lead to any 8 year old existential crises. My conclusions about this book are that it is a pretty fun premise and ultimately an enjoyable story. Though this had the trademark twist ending the story wasn't entirely about the twist and the twist wasn't so drastic as to reframe your entire idea about what has been happening. This is a solid entry to the collection. Plus if it was good enough for Hollywood to rip off, who am I to argue? Check back tomorrow for another Tale to Give You Goosebumps. Next up is "Broken Dolls." Did Adam Sandler rip off the plot from this story for one of his movies too? I guess we'll find out!